The Bachelor‘s Ben Higgins and Lauren Bushnell are still together a year after the end of the show (which already makes their relationship longer than some of the previous The Bachelor couples), but their relationship is far from perfect. But just because they have to work at their relationship (let’s be honest, who doesn’t?) 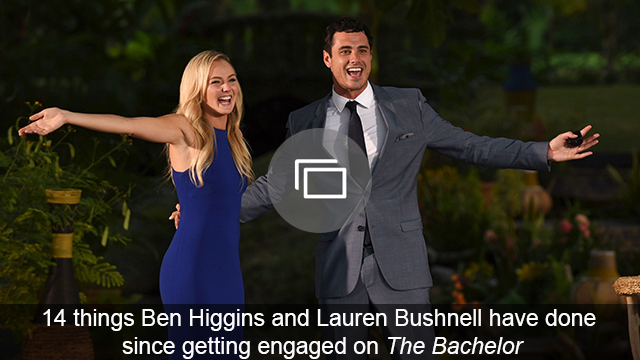 and haven’t yet set a wedding date, doesn’t mean that Higgins and Bushnell are not committed to each other — something which the pair recently touched on in an interview with E! News at The Knot Gala in New York City on Monday night, when they were asked why their new reality show, Ben & Lauren: Happily Ever After? has a question mark in the title. Hmmm, we guess that kind of makes sense. The couple doesn’t know what the future holds and it would be premature to pretend that they are going to end up together forever. If anything, maybe it’s better that they aren’t being too hasty about getting married and are taking their commitments to each other (and finding the time to get to really know each other properly before getting hitched) seriously. Something else that sparked concern among fans was when Higgins and Bushnell revealed they were attending couple’s counseling. But rather than be ashamed that their relationship has a few glitches to work out, the couple feels that therapy should not be so taboo. In fact, we could probably all learn a thing or two about their approach to therapy. Makes sense, right? We’re really rooting for Higgins and Bushnell to make it, as they’re undeniably one of our favorite reality TV couples, and by the looks of it, they may just make it to the altar after all. Do you think Higgins and Bushnell are taking a smart approach to their relationship? Share your thoughts with us in the comments below.